A very impressive launch for Neil Young﻿'s PONO on KickStarter campaign page at the SXSW Conference in Austin, TX last week. And with it, lots of good discussion on the merits of quality music and the viability of PONO here on Neil Young News: Audiophiles' Thinking and Neil Young's PONO. Some selected comments follow. With all due respect, but I don't believe in PONO if PONO just means 24 bit, 192 kHz. In that case there is no difference between Blu-Ray audio and PONO except the fact that it's portable. If that's the whole idea, to make Blu-Ray quality audio portable, then it might stand a chance. However, anyone that's saying that 24/192 is a huge difference with respect to 16/44.1 is being mislead, or just doesn't know anything about how the Nyquist Sampling theorem works. The problem with many CDs (loudness war apart) is that they haven't been mastered properly. CDs are a different medium than vinyl, so they require different mastering that benefits the CD. There is no reason why a CD shouldn't sound better than an LP. If you compare the remastered versions of EKTIN and the original LP, the CD sounds way better. So if PONO means better mastering (I'm assuming Neil uses the same masters for PONO as he did for NYA) combined with a better DAC, than that's enough. No need for 24/192, as 192kHz digital music files offer no benefits. They're not quite neutral either; practical fidelity is slightly worse. The ultrasonics are a liability during playback. The clip that shows a number of musician rave wbout an new revolution is kind of misleading. First of all, are they listeing to the same recording, but a different sampling rate, or do the versions (MP3, CD and PONO) have different mastering too? This isn't mentioned in the clip. If Neil would use the PONO files at 24/192 and downsamples to 16/44.1 and do an ABX test (double blind) I am 100% sure that when using the same DAC and speaker set up, at the exact same volume no-one would be able to tell the difference between 24/192 and the 16/44.1. Untill that double blind test happens (which is a whole lot different than a 2 minute trip in the LincVolt), I'm unconvinced. Sorry folks, do your homework before spending 400 bucks. @Harm - Thank you for that detailed analysis. Clearly, you have some serious technical knowledge and understanding of digital audio. While we can't dispute what you've said or debate the merits of your points, can we ask you this in all due respect? What would you suggest for the average music fan who wants a better experience but isn't technically savvy? That seems to be the market that PONO is aiming at. Is there really a better, cheaper and *simpler* solution than PONO? Thrasher, for portable audio, no. But 24/192 is just a waste of space. 16/44.1 or even 24/48 will suffice. As I said before, a double blind test to see if people hear the difference between 24/192 amd 16/44.1 would be interesting. No previous test has shown that people do. For home enjoyment, there are better options. They're called CDs. I did some further reading and most PONO releases won't be remastered, not in the traditional sense anyway, but just re-digitized to 24/192. In that case the same argument holds as stated above. The PONO Player is only a minor improvement on user convenience with respect to CDs. If there would be an iPOD like docking station that would allow you to operate the PONO player from your sofa using your receiver's remote, that'd be nice, THEN it could beat CDs. Not in terms of sound quality, it can only equal that, but convenience. If a future version of PONO would be Spotify-like subscription, complete with a dedicated device that would also allow for other streaming possibilities, such as Netflix, with the same DAC as the PONOPlayer has, you got a real winner. So far, all the advertising has been about resolution (i.e. 24/192) and the DAC. I say, lose the 24/192, keep the DAC, spend some time on mastering stuff right and problem solved. 24/192 isn't the answer. By the way, did you know that new EKTIN remaster actually has less dynamic range than the 1990 CD? I'll tell ya, if any current vinyl release has a better dynamic range than a CD, it's inherent to the mastering, NOT the medium. So thank you Harm for the detailed replies. Seems like some good suggestions. It does seem like the PONO project has been a moving target which has evolved with feedback from industry, etc. Who knows? Maybe PONO will still evolve before final release in Fall? And, no, we didn't realize the differences between the re-masters. Neil Young should be applauded for taking a stand against the stranglehold which companies like iTunes have over our digital music enjoyment. I’ve just spent the last couple of weeks writing a series of articles called Death to iTunes where I’ve tried to find a better alternative. It’s harder than you may think. At least with PonoMusic there is a better alternative for sound quality. In regard to the arguments about the negligible improvements in sound quality in terms of bigger files, these are missing the point. 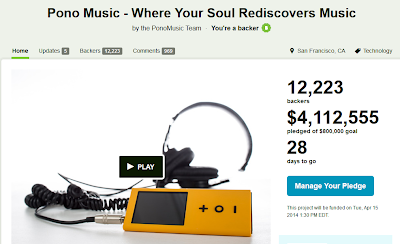 PonoMusic is about preserving the integrity of the original recordings. All of the extra information that is lost in studio recordings after being compressed to MP3, will be available again. There’ll be sounds in songs you won’t have heard since playing the vinyl three decades ago or that you never knew were there in the first place. In terms of memory, as well as the 128GB available in the player itself, PonoPlayer can accept microSD cards of up to 64GB each, so if you do need more music then you can always swap cards. It also has two output jacks, one for headphones and another stereo output specifically for your home audio system. All in all, it seems like a pretty exciting package. Besides, I haven’t paid any attention to anything Eric Clapton has ever said, so I’m not going to start now. You highlight a post that gives very clear argumentation and questions about pono, then you post an article that completely disregards everything Hamm said. This is illustrative of the the entire Pono debacle. It's all heresy and hopeful delusion. There's no specific info about anything. The only specs concern the bits, which, as Hamm and many others have pointed out, are pointless. The real issue is mastering. It's fairly clear that the downloads from Pono will not be better masters given the fact that even Neil'd most recent remasters are less dynamic than the original, straight from vinyl, editions that came out in the 80s/90s. They'll just be the most recent mixes remastered yet again, but up to 24/192. What we'll have then is high res loud mastered music. Which, incidentally, is already available at HDtracks. Now, if Pono does come with a better DAC, then it might have a chance in a niche sort of way, but there are already high end portable players. See the Fig, for example. The reality is that you and Neil and most other people have no idea what you're talking about and are absolutely caught up in marketing hype. Much like you were with Archives I and continue to be with anything Neil Young says or does. Delusion can be fun, but man does it cost a lot of money...and lives (the chinese folks who will be forced to make these players). @Zuma - thanks and that's exactly the whole point here. That one can read/hear/argue two or more sides of everything. Truth is relative and subjective. Take something say, like the Ukraine situation, for example. Read the western and eastern news on this and there are at least 2 entirely different narratives being spun. And the Ukraine is a BFD relative to something like PONO. The reality is that there is no reality. The delusion is surreal -- one's truth is the only reality. I'm going to go home and test EKTIN 1990 cd to the ORSvinyl. I can't imagine that the CD sound quality can not be improved on. It should be mentioned that the vinyl experience can vary drastically depending on the needle/record player, whereas I don't believe cd players have any difference. (not talking about speakers). I have a friend at work that says to get decent CD sound you have to spend at least $1000 on a 'decent' CD player. All you hear with the 'cheap' ones are the thousands of 'errors' etc. I think he's one of those audiophiles who's so intent on listening to the sound of the system that he doesn't even really listen to the music itself any more. that's a strange discussion - yes, you are right - a lot of better sound depends on the state-of-the-art remaster. of course. but on the other hand, you really ignore some technical/musical facts (neil explains it - the stuff with the echo). digital is not capable to correctly deal with that - because of the low resolution - with a higher resolution you can get that. ok - i believe it - i never heard it. but now i come up with another topic - which hassles me. i got a nice vinyl collection - 2000 up - and i got a lotta stuff remastered - nya 1 on blueray - beatles box on cd - got all the vinyls anyway - but the remastered cd's of the beatles sound totally different - way better (here we are again - a lot is the remaster) - but my problem: yes I want the better sound - but do I want to buy the stuff I love again (in some cases for a 3rd or 4th time) - NO!!!! because it never ends. and one more thing - the nya/ps series live at the cellar door vinyl is complete trash. i bought 3 - for me and friends - all misprint - sent em back - bought 3 other one's - sent em back .... sometimes vinyl can be also frustrating .... don't make a religion out of it - enjoy the sound - and thanks to neil for putting such an effort in this great topic. To my ears a well recorded and then well mastered CD can sound incredible. But that is too small a percentage of CDs. But when it is done right... The same will be true of PONO. I love vinyl. But too many people are sold on the romance of vinyl. Much of today's vinyl is from digital mastered, basically like cutting the CD to vinyl (most of the Beatles vinyl is done that way). And then vinyl aficionados say how much better it sounds. Yeah, a CD with surface noise is better. CDs can be great, but they are dying as well. What PONO can accomplish is good sound in a world of sound files. The high res is probably overkill and a hurdle in terms of cost and file size. But hey, Neil is shooting for the right thing. I'm going to do my own double blind test and see if I can hear the difference between 24/192 and 16/44.1. I KNOW I can hear the difference between even a really high quality mp3 and other HQ lossless file formats, and I've had supposedly knowledgeable people tell me that that's not possible. I'll post the results of my test once I've done it. P.S. I can also hear the enormous difference between a well-mastered CD and vinyl. There's a big difference to my ears.